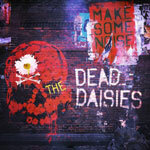 Just over a year past the release of their previous record, Revolución, The Dead Daisies, with a slightly different lineup, have gathered again and sooner than expected they come out with its third record to date. This band or project, whichever you prefer, was co-founded in 2012 by Australian guitarist David Lowy and today he remains the sole original member as quite a few more or less well-known musicians have come and gone over the years. Unquestionably, the inspiration to what they do derives from their younger days as either musicians or simply just as fans. For the most part the record has an atmosphere of classic rock music with basically a nice swing and a really solid groove overall and Corabi's voice does really well on top of the music performed. Mendoza and Tichy bring forward a very firm foundation and are in my opinion a huge part of the total outcome of the record, even if the guitar playing absolutely has a lot of handsome moments too. People generally have different views about cover songs, mostly because of what kind of relation they have to a song's original version in the first place, I reckon. With that in mind, I think that this band has been able to make pretty good versions of both Fortunate Son and Join Together. Maybe those songs necessarily aren't essential to improve this album's capacity, but they don't make the album a less effective experience nonetheless. This ensemble has created a good album together, with songs that are very even in quality from the beginning to the end, yet it lacks those absolute rockets and those songs that you really are gonna freak out to. Make Some Noise isn't an amazing piece, of unforgettable magnitude, but I'm still satisfied with what's given and the end result is kind of what I expected out of this unit, really. It's definitely worth checking out and if you don't like what you hear, you can always locate the stop button on whatever device you intend to use.